In 1904, Ambrose Fleming invented the thermionic diode, a device allowing electric current to flow in one direction only. The invention gave birth to the modern electronic age. Fleming also devised the commony used hand rules for electric motors and generators. An earnest Christian, Fleming founded a creationist anti-evolution movement. In 1904, Ambrose Fleming invented and patented a device he called the oscillation valve, also called the thermionic diode. Today in the USA Fleming’s device is more commonly known as the vacuum tube or tube. In the UK it is commonly known as the thermionic valve or valve. Fleming’s diode passed electric current in only one direction in a circuit and hence could convert AC electricity into DC electricity. In this mode of operation it can be described as a current rectifier. Fleming’s diode was an essential component in electronics goods such as radios, televisions, and computers until it was replaced by semiconductor devices such as transistors in the 1960s. Fleming’s diode together with a galvanometer in a tuned electrical circuit acts as a rectifying detector of radio waves. Fleming’s device began the age of electronics. Fleming designed the power plant that Marconi used to transmit the first radio message across the Atlantic. Vacuum tubes are still used in electric guitar amplifiers. Many guitarists prefer the sound produced by tube/valve amplifiers to those based on solid-state technology. 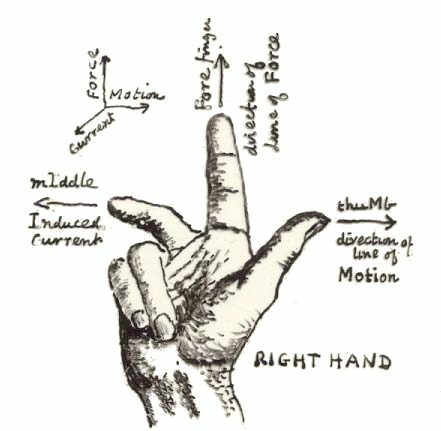 Fleming devised the left-hand rule for motors and right-hand rule for generators to help himself and his students remember the relationship governing the directions of electric current, electric field, and force. The metal filament in a thermionic diode/valve/tube glows white hot when it is working. John Ambrose Fleming was born on November 29, 1849 in the small city of Lancaster, England, UK. He was known by his middle name, Ambrose. His father, James Fleming was a minister in the Congregational Church. His mother was Mary Ann Bazley. Ambrose was the eldest of their seven children. When Ambrose was three years old the family moved to London. He was educated by his mother to age 10, learning to read seated on her knees. Ambrose learned to use mechanical tools in his grandfather’s cement works. At age 11, he built model steam engines and boats. He constructed a camera from a cigar box, becoming a skilled photographer, making his own photographic plates from collodion and silver nitrate. He developed his own photos using potassium cyanide. He learned about electricity and built batteries and capacitors. He used these to give powerful shocks to any willing friends who expressed doubts about the potency of his homemade electrical equipment. Ambrose was congenitally deaf, a condition that worsened with age. It did not affect him too badly until he was middle-aged. At age 16, Fleming enrolled at London’s University College, intending to become a schoolteacher. He took courses in Mathematics, Chemistry, and Experimental Physics. Money problems forced him to withdraw after a year. He found work in a stockbroker’s office and studied part time at the University of London. In 1870, age 20, he obtained a Bachelor’s degree with first-class honors. Fleming worked as a teacher, saving hard. In 1872, age 22, he enrolled as a Chemistry student at the Science Schools in South Kensington – these later became Imperial College. In the Physics Laboratory he watched Frederick Guthrie demonstrate the asymmetrical behavior of electrically charged hot metals – this was the Edison effect, observed a decade later by Thomas Edison in 1882. Years later, in 1904, Fleming would utilize this assymetrical behavior to invent the diode and begin the electronic age. In 1874, Fleming began working as a Science teacher at Cheltenham College. He also began publishing his own work – he gave the inaugural paper at the first ever meeting of Physical Society of London in 1874. He studied the works of Michael Faraday, and in 1875 reported on electromagnetic induction to the British Association for the Advancement of Science. He began a correspondence with James Clerk Maxwell, and decided to study Maxwell’s work in detail. In 1877, age 27, Fleming enrolled at the University of Cambridge, where he battled to understand Maxwell’s very difficult lectures in electromagnetism. Only one other student took Maxwell’s course! In 1879, the University of London awarded Fleming a DSc for his thesis Electricity Treated Experimentally, and the following year Cambridge awarded him a first class honors degree in Chemistry and Physics. Fleming worked as a university lecturer until, in 1882, he became a consultant to the Edison Lighting Company in London. In 1885, he was appointed Professor of Electrical Technology at University College London, a position he held for 42 years. In 1899, while continuing to work as a university professor, Fleming began working as a consultant to the Marconi Wireless Telegraph Company. He sought a better means of amplifying radio waves, which had been discovered by Heinrich Hertz in 1886. Fleming realized his answer lay in the Edison effect he had seen Frederick Guthrie demonstrate in 1873. 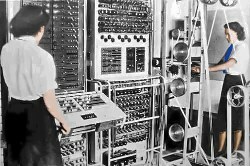 A Colossus computer operating during World War 2. The codebreakers at Bletchley Park in the UK, headed by Alan Turing, built and used the world’s first electronic digital programmable computers to decode German messages. Each computer required thousands of thermionic valves. In 1873, Frederick Guthrie observed that a piece of negatively charged, red-hot iron lost its charge into the surrounding air. When the iron was positively charged, it held on to its charge. This assymetrical behavior, dependent on the sign of the electric charge, was the basic science behind Fleming’s invention of the diode. A diode allows electric current to flow in only one direction, hence it can convert AC electricity to DC electricity. An early thermionic diode made by Fleming. Fleming’s diode consisted of an evacuated glass bulb housing two electrodes. The diode was connected so the first electrode – a wire filament – was made white hot by electric current flowing through it. As Guthrie had observed, electrons can leave the hot filament, but cannot return, hence current can flow in one direction only. A metal plate formed the other electrode separated from the first electrode by a vacuum. Electrons cross the vacuum, forming an electric current. They can do this only when the hot electrode is negatively charged. When there is an alternating voltage, current flows through the diode when the hot electrode is negative, and stops flowing when the hot electrode turns positive. The diode rectifies alternating current, converting it to direct current. Fleming came up with the idea for the thermionic valve in October 1904, and patented it the following month. In February 1905, he read a paper at the Royal Society about his invention, entitled On the conversion of electrical oscillations into continuous currents by means of a vacuum valve. As part of his agreement with the Marconi Company, Fleming had to sign his patent over to them. There was litigation in American Courts between Marconi and Lee de Forest, who patented a triode in 1908. The triode was an improvement over the diode, because it made signal amplification possible in addition to rectification. The courts ruled de Forest’s patent infringed Fleming’s diode design, but Marconi and de Forest reached an understanding allowing each of them to market their products. In 1943, the US Supreme Court ruled the Marconi patent invalid because of a restriction added to it by the Marconi Corporation in 1915, restricting the invention to high frequency alternating currents. While working as a professor, Fleming devised the hand rules familiar to every student of physics. 1928: Faraday Medal of the Institution of Electrical Engineers. In June 1887, age 37, Fleming married 30-year-old Clara Ripley Pratt, a lawyer’s daughter. Clara died in 1917. In 1926, age 76, Fleming retired to the small coastal town of Sidmouth to share a house with two of his sisters. He converted the basement into a laboratory. Fleming was devout Anglican. After he retired, he preached about the Resurrection and founded the creationist Evolution Protest Movement to attack the theory of evolution by natural selection. In July 1928, Fleming married the soprano soloist Olive May Franks. He was 78 and she was 30. Sir John Ambrose Fleming died at age 95 in his home in Sidmouth on April 18, 1945. He had no children and left significant amounts of money to Christian charities that helped the poor. "John Ambrose Fleming." Famous Scientists. famousscientists.org. 16 Mar. 2018. Web.